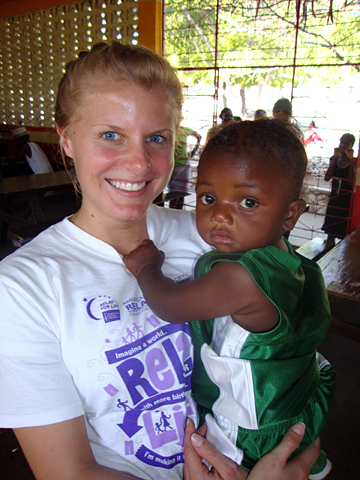 Rachel Powell held a baby in Montrouis, Haiti, during her recent with Mission Possible. I welcomed 2011 serving the Haitian people through my job at Mission Possible, a nonprofit Christian agency in Findlay. On Jan. 1, I co-led a team of 24 people from the Findlay and Akron areas, as well as California, Texas, and Ontario, Canada, to Haiti for a week full of service. Mission Possible, which has the mission to “equip the next generation of Christ-centered leaders,” has six schools and one vocational school in Haiti and one school in the Dominican Republic. The schools are run by the native people, and there are about 3,500 students between the two countries. The focus of Mission Possible is to teach the students to become sustainable and to know Jesus and bring Him into their communities and to give the nation Christ-centered leaders in their communities. Our January trip was focused on community health education. We went to each of our schools, some of which included an hourlong hike up the mountains because vehicles can’t get to them, to set up medical clinics in these communities. The volunteers also set up educational sessions in which we taught the Haitians about cholera prevention and treatment, how to sanitize water, how to dig a latrine, and how to properly wash their hands. It was so rewarding to see the Haitians so intent on the cholera teaching. They are so afraid of cholera because they don’t know much about it. All they know is more than 2,000 people have died from it. The question was raised at one of our schools, “Can you come back and teach more people about cholera?” We encouraged them to take ownership of this, and they were really excited to go out and teach their neighbors and save lives. We saw a total of 649 patients in four days. We treated people with problems that included malnutrition, skin conditions like ringworm and intestinal worms, and a variety of stomach problems. During the trip, we educated about 1,000 people and passed out 1,000 adult and children health kits that included soap, shampoo, a toothbrush, toothpaste, floss, and educational information in Creole on cholera and teeth brushing. A big thank-you to all of the community members who donated the supplies. Though we were able to touch a lot of people’s lives, the work in Haiti is not near over. During our trip, we saw many children with signs of malnourishment, including orange hair. There were many families who hadn’t eaten because there simply is no food. Our hearts broke for these people and the many who suffered during the last year trying to recover from the Jan. 12, 2010, earthquake. Mission Possible is working hard to teach the Haitian people about sustainability and not dependability. We want them to invest in their lives and make something of their situations. Interested in joining me at Mission Possible? Visit www.ourmissionispossible.org or contact the organization at 419.422.3364 or rachel@ourmissionispossible.org. Powell is a graduate student in the Master of Public Administration Program. As the spring semester unfolds, The University of Toledo is continuing to promote sustainability efforts and is encouraging everyone to do the same with the Second Annual RecycleMania Tournament. During the tournament, which kicked off Jan. 23 and continues through April 2, the University tracks and reports recycling weights each week. While the University is excited to participate in the event, recycling needs to be an intentional part of UT operations, not only during the 10 weeks of RecycleMania, but also year round, said Tom Trimble, UT associate director of student unions. According to Trimble, UT has had sustainability programs in place for some time, but there previously was not a reporting process as complete as it is now. With programs like the RecycleMania Tournament, a better reporting system and other sustainability practices, the University’s College Sustainability Report Card grade jumped from a D+ in 2009 to a C+ in 2010, according to a national survey conducted by the Sustainable Endowments Institute. Recycling bins, courtesy of Rocket Recycling and Building Services, are located virtually on every floor in every building around Main, Health Science and Scott Park campuses, totaling more than 2,000 bins. Small recycling containers are placed in nearly every individual office as well. Participation in the 2010 RecycleMania resulted in UT finishing third among participating MAC schools, seventh among participating schools in Ohio, and 172 out of 346 participants nationally. Track the University’s progress at www.recyclemaniacs.org during the competition. For more information about RecycleMania and UT’s sustainability efforts, visit the RecycleMania website or contact Trimble at 419.530.5203 or thomas.trimble@utoledo.edu. If your work area is in need of a large recycling bin or additional small containers for offices, contact Rocket Recycling at 419.530.4942. After the tragic loss of Dr. Robert Brundage, a UT graduate and community activist, the Lake Erie Waterkeeper Association wanted to honor his memory. The result was an annual $500 scholarship in his honor, and this year Betsy Bodamer Scarbro, a PhD student at the UT Lake Erie Center, is the recipient. Bodamer Scarbro has developed an aquarium system that studies how low-oxygen conditions affect fish and other organisms in Lake Erie. Brundage, who died in 2009 as a result of injuries he sustained during a robbery, was a research scientist, accomplished musician, and advocate for social justice, education and the environment. Brundage, or “Dr. Bob” as he was often called, was a native of Toledo and received his bachelor’s degree from UT. He earned his doctorate from Brandeis University. He was committed to water quality in Lake Erie, especially the Maumee watershed, and served on the board of the Lake Erie Waterkeeper. 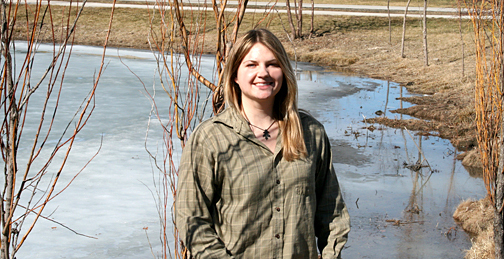 “This is a unique scholarship to recognize a Lake Erie Center graduate student for important research to improve Lake Erie environmental quality,” Stepien said. “This is 90 percent of the USA’s surface freshwater and is a limiting resource. It is critically important to protect and conserve this resource for our nation. Each day hundreds of thousands of readers log on to HuffingtonPost.com for the latest news and sports commentary. 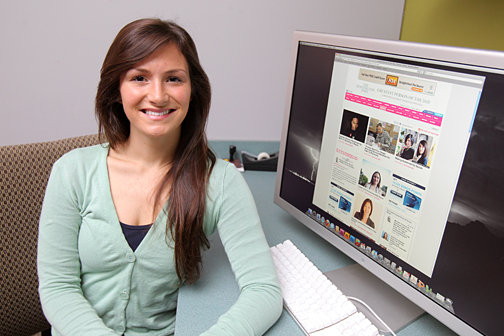 Law student Kyle Smitley was featured as Huffington Post’s “Greatest Person of the Day” last week; her photo is in the center of the webpage. She was selected for the honor thanks to her eco-friendly children’s clothing line, barley & birch. When members of The University of Toledo community visited the popular site last week, they saw a familiar face: Kyle Smitley, a third-year law student and founder of the eco-friendly clothing line barley & birch, who was featured as the “Greatest Person of the Day” on the popular website. The Huffington Post launched the “Greatest Person of the Day” program in the fall as a way to highlight ordinary Americans who find a way to make their lives or the lives of others better. Smitley’s eco-friendly clothing line launched in 2009 and has found a following online and in stores. barley & birch donates at least 30 percent of its profits to both environmental and social causes around the world. Thus far, barley & birch has helped men, women and children in several areas, including Haiti and Nicaragua. Smitley’s goal is for barley & birch to grow as a business, thereby extending the company’s philanthropic efforts. The company is one step closer with the establishment of the barley & birch foundation, which will allow businesses and individuals to contribute to barley & birch’s various projects, including an orphanage recently built in Haiti. Even with taking on the new responsibility of the foundation and the ongoing business demands, Smitley still finds time for her schoolwork and maintains a high grade point average. With graduation right around the corner, Smitley is looking forward to opportunities the future holds. She will return to Napa, Calif., for her externship this summer while studying for the bar exam. She plans to launch a new company this year and continue to work with her foundation. Even as some of the headlines fade, The University of Toledo is continuing to take a tough stance on bullying and harassment. The word “bullying” is often thought to be a juvenile term for a juvenile act, said UT Police Chief Jeff Newton. Other sanctions will include discipline, up to and including expulsion from the University, through the Student Conduct Office, he said. Newton also pointed out that bullying is no longer just face to face. Bullying via electronic or social media also is serious, he said. For now, students, faculty and staff can go to the Office of Institutional Diversity website at www.utoledo.edu/offices/oid/training.html to find a complaint form along with the University’s harassment policy, training and education. Martinez said UT soon will bring online a web page dedicated to preventing bullying, providing more information and education, highlighting resources like the Counseling Center, and creating an anonymous reporting tool. The newest staff members in the UT Division of Student Affairs were welcomed to campus with an open house last week in the Office of Multicultural Student Services. 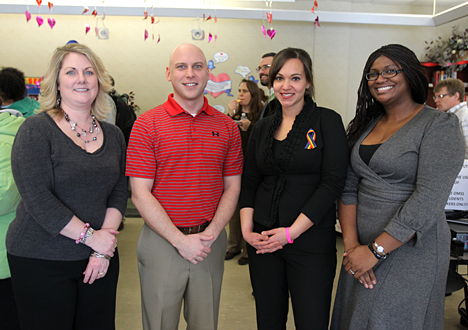 Several students, faculty and staff attended the Multicultural Student Services open house last week to meet new staff members, from left, Stephanie McGuire-Wise, Dale Pelz, Fatima Pervaiz and Jessica Merritt. The event, complete with a Valentine’s Day holiday theme featuring a card-creating station and a chocolate fountain, was a fun way to invite students to meet the new members of the University community and learn more about the services they and others in the division can provide. “Everyone at the University is here for the students, but these new staff members have specific roles to reach out to students with programming, training, counseling and other services to ensure their education and personal success,” Dean of Students Michele Martinez said. Fatima Pervaiz has been hired as the program coordinator for the Office of Multicultural Affairs. Her work will focus on diversity training for students and student organizations, as well as providing support for LGBTQA Initiatives. Pervaiz previously served as a youth educator for the AIDS Resource Center Ohio and Planned Parenthood of Northwest Ohio. Dale Pelz will serve in the new role of retention specialist. 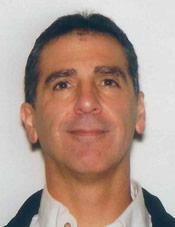 Prior to joining UT, he worked at Kent State University and Arizona State University in academic affairs. Stephanie McGuire-Wise is the newest clinical counselor to join the UT Counseling Center. She comes to UT from Behavioral Connections of Wood County Inc.
And Jessica Merritt, currently a project manager in the Office of Student Involvement, will provide support for African-American Initiatives within the Office of Multicultural Student Services. 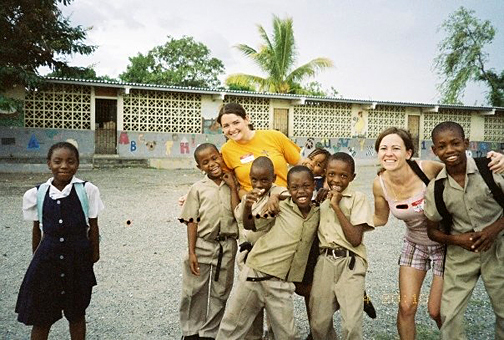 Jessica Kelley, left, and Jaime Schuette took a break from mission work in Jamaica to play with local children. Jessica Kelley, a senior at The University of Toledo majoring in geography and planning, has spent much of her college career performing community service. Due to her service in the UT community, the Toledo community, and communities across the country, she has been named the 2010 annual Jefferson Awards for Public Service “Champion” winner. To list all of the events, clubs, organizations and activities in which she has participated in would fill the page, though a few include Campus HEAT, Habitat for Humanity, Josina Lott, and the Spirit of America Foundation. She has had leadership roles in most of the organizations and has mobilized other students on campus. Descriptions her other nominators used were reliable, trustworthy, dedicated and a strong leader. They mentioned that the events she took part in would not have been as successful without her help. “I would encourage everyone to participate in some sort of community service because it ties us all together; it makes us aware that we are part of a bigger picture,” Kelley said. As UT’s annual honoree, Kelley has the opportunity to attend a national Jefferson Awards seminar this June in Washington, D.C. If you know of an unsung hero who dedicates his or her time to volunteering and community service, be sure to submit a nomination for the Jefferson Awards. You can do so at here, and on the new Facebook page, The University of Toledo Jefferson Awards. The newly updated Facebook page will include information and photos of the monthly honorees, volunteer information and updates on nomination deadlines. The deadline for this month’s nominations is 9 a.m. Wednesday, Feb. 23. The University of Toledo is updating its core curriculum to orient student learning around a set of five competency areas for all students to master upon graduation. The UT Core Experience includes focus on the core competencies of communication, scientific and quantitative reasoning and literacy, personal and social responsibility, information literacy, and critical and integrative thinking. The core competencies were articulated by a committee of faculty and administrators. The core selected was broad enough to include all the necessary learning outcomes and specific enough to be relevant and get to the heart of what education means in the 21st century, Pryor said. These five core competency areas are naturally already part of the University, but establishing a UT Core Experience will incorporate the core throughout more general education and program courses. The core competencies, which will be measured through the assessment of student electronic portfolios, are developed and augmented through general education courses, program major courses, experiential learning, learning communities, co-curriculum and prior learning, Pryor said. For example, general education courses will include the competencies in the course descriptions and syllabi. Assignments will be added to the courses to assess the competencies, and those assignments will be included in the portfolios. Pryor presented the UT Core Experience to the UT Board of Trustees Academic and Student Affairs Committee last week. Throughout the spring, the core competencies will be deliberated at the college, department and Faculty Senate levels of the University to incorporate them into the curriculum. The goal is to have the UT Core Experience in place by fall semester. The role of parents in preventing alcohol-related risks among college students will be explored during a workshop this week at The University of Toledo. Dr. Rob Turrisi, a professor of biobehavioral health at Penn State University who is known as a national expert on alcohol and substance abuse prevention, will lead the workshop on “Bridging the Gap: Parents and Prevention” from 8:30 a.m. to 3:30 p.m. Thursday, Feb. 24, in Student Union Room 3018. The workshop will look at the role of parents in reducing student alcohol-related risks and how those who work at colleges and universities can involve parents in supporting their policies. The training will include discussion on the problem of high-risk drinking, the role of parents and peers in the availability of alcohol, parent-based interventions of high school and college students, and an overview of evidence-based parent programs to prevent student high-risk drinking. The program, which is offered at no cost, is aimed to assist those who work at colleges and universities and work closely with students, for example, staff in student affairs and residence life. The workshop is sponsored by the UT Alcohol, Tobacco and Other Drug Prevention Committee and the Ohio Drug-Free Action Alliance. For more information or to register for the training, contact Alexis Blavos, alcohol, tobacco and other drug prevention specialist, at alexis.blavos@utoledo.edu. An accomplished documentary filmmaker, Lois Lipman has received honors for a piece about understanding boys with Asperger’s syndrome, which is an autism spectrum disorder. Lipman, a part-time faculty member in The University of Toledo’s Department of Theatre and Film, recently received the Television Internet and Video Association Peer Gold Award for Best Student Non-Dramatic Documentary. The Peer Awards are judged by industry professionals who choose the most skilled and innovative individuals of the production community. 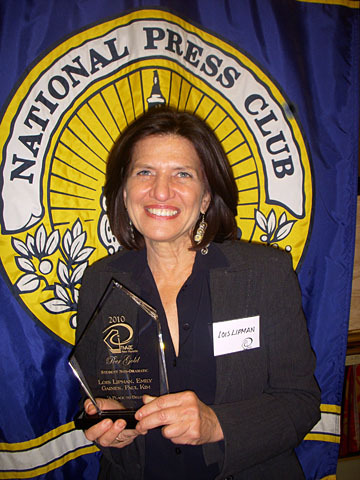 “I felt so fortunate to have been recognized among my peers,” Lipman said. Her documentary was part of a thesis film she created while attending American University in Washington, D.C., for her master of fine arts degree. The documentary, “A Place to Belong: Aspergers and a School,” is about two 11-year-old boys who were bullied and never fully understood by teachers. The film follows the boys to a different school created for those who have Asperger’s syndrome to allow them to be taught in a safe place and learn self-confidence and communication. With the help of the school, the boys find acceptance. Lipman produced and co-directed the film, as well as served as a camera operator. “A Place to Belong” also received Best Documentary and Best Edited Film recognition at American University’s Film Festival and a CINE Golden Eagle for Student Documentary. She shares her experiences at UT teaching part-time documentary production. Her goal is for students to be able to tell stories of strong characters that others can connect with. Lipman has been involved in documentary production for 12 years and has worked on documentaries for the BBC and “60 Minutes” in London. Lipman also has received the distinguished Peabody Award for “From Harlem to the Barcelona Opera House — Arthur Mitchell and Dance Theater Harlem” and the American Women in Radio and Television Best Documentary for the film “ ’Till Death Do Us Part” about dowry deaths in India.